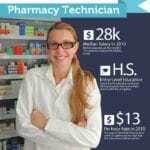 If you are considering becoming a pharmacy technician, you probably want to know as much as possible about the salary opportunities that comes with being one. 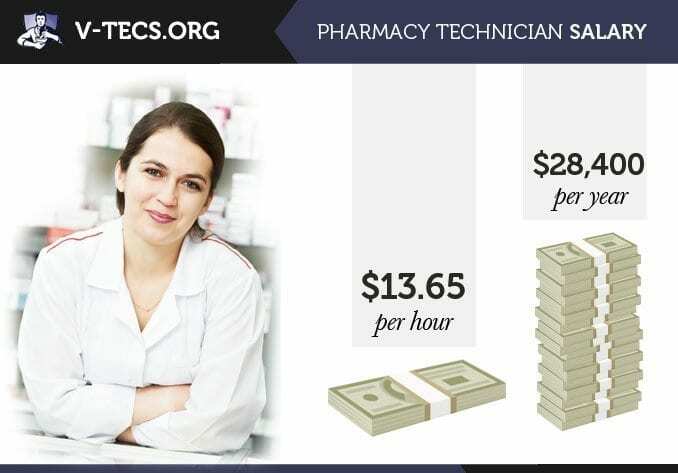 The pay scale for a pharmacy tech can vary from state to state and it can vary from position to position. It all really depends on the education and training you have, along with where you live. Remember, those that live in states with higher costs of living are usually going to make more to compensate for the high living expenses. That being said, lets take a look at some of the averages. The average Pharmacy Technician salary for those just getting into the field as a pharmacy tech is usually around $30,000 a year. Pharmacy technicians can expect to earn more after their first four years in the industry, and when they have furthered their education. Then they can expect to make between $30,000 to $40,000 a year. Those that make over $50,000 a year have been in the business a long time and have experience and training that prove they are worth that much money. Those pharmacy technicians that have additional certifications within the field will always have a greater chance to make more money in a position than someone that doesn’t have that additional certification but has the same experience generally. Those that are working in hospitals generally make more than those that are working in a retail setting as well. Taking that one step further, those that work at the bigger hospitals are generally going to make more than those that work at smaller hospitals in more rural locations. Pharmacy technician salaries are supposed to rise over the next few years, but it is really limited as to how much someone can make. The cap seems to hover around $50,000 a year, and that is when you have built up the experience and training necessary to take on a supervisory role. But, the requirements to become a pharmacy technician are far less than the other medical careers that may make a bit more money each year. So, it is really up to you how much you want to take on and if this is going to be the right career for you. Those that pursue graduate level pharmacy studies are going to make much more than the salaries mentioned above. Previous PostPrevious What Does A Pharmacy Technician Actually Do?